Building a healthier body requires dedication to not only your diet, but also two forms of exercise -- aerobic exercise and strength training. 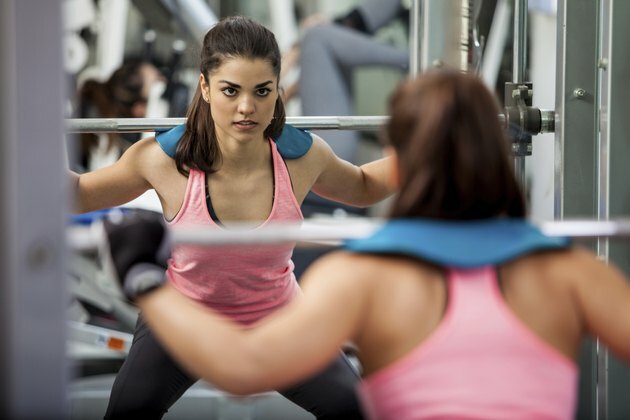 The latter, which is also known as resistance training, is a form of exercise in which you strengthen your muscles by pushing against a force that can take several forms -- hence the term "resistance." These exercises strengthen your muscles but also help you burn calories, which can lead to fat loss when you achieve a calorie deficit by burning more calories than you consume. Resistance training is important to include in your fitness routine no fewer than twice per week. A simple example of resistance exercise is bodyweight exercise, in which your own body's weight creates the resistance needed to strengthen your muscles. These exercises are suitable at the gym and at home, but are ideal at home if you don't have free weights or if you're on a budget. Bodyweight exercises can include squats, lunges, burpees, pushups, crunches, mountain climbers and planks. Two other forms of resistance exercise, which you'll typically find at a gym, are exercises with free weights and weight machines. Examples of free weights include barbells and dumbbells, while a long list of weight machines are designed to work specific muscle groups. Free-weight exercises include dumbbell curls, barbell bench presses, barbell squats and dumbbell flyes. Weight machine exercises include the Smith machine bench press, seated leg press, shoulder press and lever triceps dip. Can You Exercise Your First Month of Pregnancy?